And now people want to talk about it…. so let’s get some things straight. The French electoral system magnifies this urge. In the first round, it’s said that the French vote with their hearts, but in the second round with their heads. And how their hearts must be feeling. For those of you reading in the UK, imagine going into an election where last night police officers were shot dead in Oxford Street. Where last year, a suicide bomb was detonated outside Wembley Stadium as the England team were playing with our Prime Minister inside. Where a gig in the West End was destroyed by terrorists killing the audience. Where those terrorists sprayed restaurant goers in Soho and Leicester Square with bullets. Where a van mowed down families enjoying the sunshine on Bournemouth beach. Where journalists at Private Eye were murdered in their office. This horrific exercise of the imagination doesn’t seek to belittle the trauma of the French: only to make it more understandable when you consider how people might vote this weekend. Just looking at the polling numbers would fail to appreciate the mood of the French people. Markets struggle with this, and right now, they continue to believe the risk of market dislocation from this election is low – and manageable. The Dutch vote calmed some nerves by a poorer than expected showing from populist Geert Wilders. But this is to misunderstand the impulse that is taking place across the developed world. It’s not populism per se, but rather a surge towards the anti-establishment. Geert Wilders had been on the political scene for decades; the anti-establishment sentiment came out in the fact that a record number of parties contested the election. The Dutch proportional electoral system meant that it was possible to register a very specific protest vote: it didn’t need to focus in onto just one party. For example, the party representing Turkish interests managed to gain 3 seats. Emmanuel Macron is just another example of this. Cleverly setting himself up as an independent, with a whole new party, he has been able to shed his attachment to the previous failed administration. This, despite his background as an Economy Minister in that administration, plus being a former banker and Enarque. We will find out on Sunday just how well he has shed his establishment skin. But then the question will become how he will govern, with his party unlikely to have enough machinery to win the legislative elections in June. Will his Prime Minister come from the Republicans, or even the National Front? The event risk for European assets doesn’t end this weekend. The question is: how well are portfolios prepared for this outcome? If you fear complacency, consider EUR/JPY downside… but if you believe France is a sideline issue for a reflating world, then consider buying that dip! Which side are you on? Answers on a postcard pls! 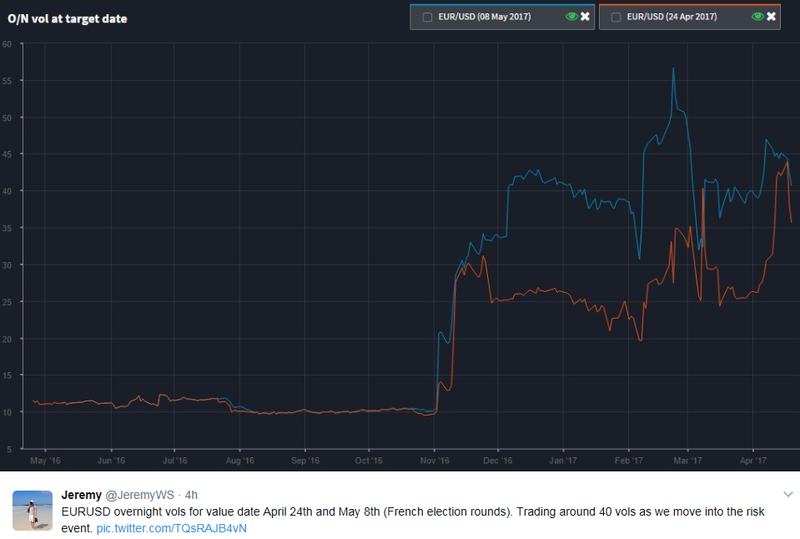 So the volatility expected in EUR/USD over the night of the 1st and 2nd round of the French elections is around 40% and 35% respectively. Ahead of Brexit, GBP/USD equivalent volatility was more like 150%; for the US election in EUR/USD more like 100%. Either way, the point is clear: we may be expecting some market movement, but nowhere near as much as we saw last year. This has largely coincided with the surge in the polls by “market friendly” Macron (and even the resurgence of Fillon). The narrative thus far is that someone the market likes will make it through to the final round, and then he will go and win that one too. Nothing to see here, please move along. In fact, haven’t those political risk events from last year also determined that any kind of crash in risky assets is over in but a flash – so if anything, you’d want to be ready to sell vol / buy carry / wear diamonds? The reasons for this convergence in the past month? Firstly, Fillon staunched the bleeding. If you’re going to have a scandal come out, get it all out early. Secondly, Le Pen’s campaign has been lacklustre, with headlines stolen by the new kid on the block, Macron. And then finally, the joker in the pack: the far-left candidate Jean-Luc Melenchon has staged a last minute rally, throwing predictions for the winners of the 1st round up into the air. Why has he done so well? It would appear that some left-wing voters aren’t happy to sign up to pseudo-Blairite Macron’s bourgeois centrist platform. In effect, the Melenchon surge has occurred precisely because the market’s favourite, Monsieur Macron, has been doing so well. If you want to be complacent, you could say that if it’s a sign of Macron’s strength, then it’s even more likely he will win the whole thing: in other words, a sign that we really will get the market-friendly outcome. So you check the polls again, relax, and sit back and wait to buy the dip. There goes the first warning bell: we know the polls have been flawed in recent years. Across the world. And largely because we are now experiencing a significant redrawing of political landscapes as The People vent Their Frustration with The Man, what with that whole financial crisis/austerity/low wages/tech revolution thing going on. Polls frequently work by drawing conclusions off baseline scenarios. But what’s the baseline for now? Second warning bell: So, the 1st round has become incredibly predictable, with each candidate polling at a similar level. How do we now re-distribute voters into the 2nd round? 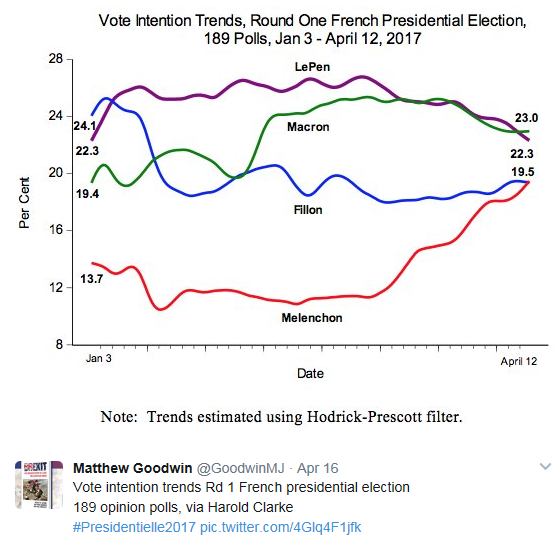 If left-wing voters are choosing Melenchon over Macron now, will they choose Macron in a 2ndround just two weeks later? Would Macron rank over Le Pen? Will they turn out to vote at all? So does the alleged “right wing” Fillon voter turn to Macron in the 2nd round even though he wants to meet the EU’s deficit target? Or does that voter fear even more austerity, preferring to plump for the fiscal largesse of Marine? If anything, the four-way split in the polls just goes to show how incredibly unpredictable this French election is. Two of those four candidates want to force a significant new relationship between France and the EU. That’s a 50% chance that we get someone in the second round who would be incredibly disruptive to European assets. That suggests a 25% chance we end up with that in the final round too. And in just four days’ time, that probability could double to 50% if Melenchon or Le Pen get through. Let’s not forget that Donald Trump was only polling at 36% on the actual day of the US election. We may well believe that 25% is a risk we are happy to bet against. We may well believe that the forces of selling vol and earning carry will always continue to pay off. We may believe that reflationary momentum in the world economy is so strong that it doesn’t matter who runs France. After all, that’s been the lesson of the past 18 months, hasn’t it? But couldn’t we also easily believe that a failure to deliver a “market friendly” candidate in an election in one of the founding members of the EU will cause a fundamental re-think of whether to hold European assets? And that the probability of that happening is not zero, nor 1 in 4, but potentially evens at 50-50? Well well well. Theresa May, you tinker! Isn’t it nice to know that some things don’t get leaked any more?? A General Election is now just 7 weeks away. Rounding off a lovely 4 year period of a Scottish referendum, then a UK GE, then an EU Ref, and now another GE. Oh and some local council elections in May as usual too. 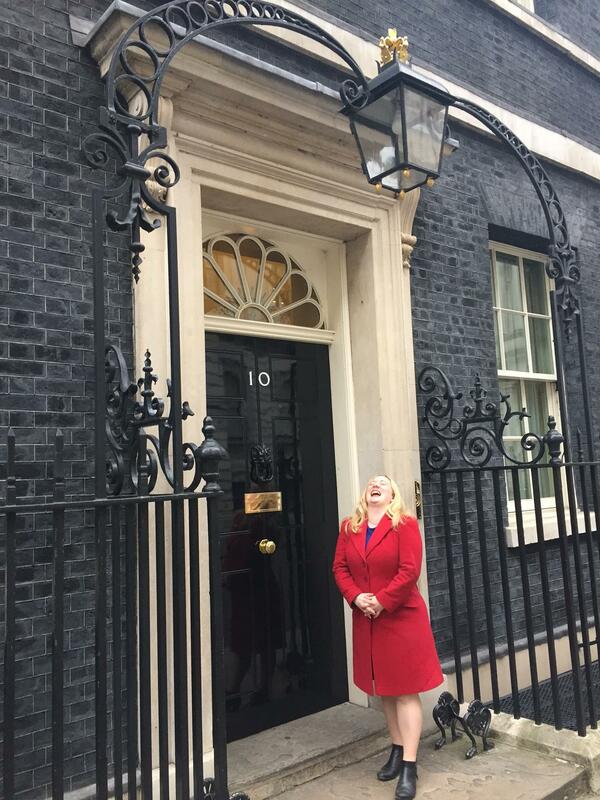 The BBC interviewed Brenda in Bristol, amongst others, who were astonished that we had to bother with yet another vote. Voter fatigue might be one factor that fails to deliver the massive Conservative majority that’s expected given current polls. There is talk of a 140+ seat majority for them with a lead of ~22pts over Labour (Thatcher won 144 seats in 1983 with a similar poll lead). Turnout is one element that may make the final result quite unpredictable. Voter fatigue might be one thing, but surely disappointed Remainers will be absolutely desperate to turn out? Or Soft Brexiteers? If Theresa May is asking for a mandate to pursue her Brexit, then what if everyone against that view turns out while her voters stay at home? 1) They would need to coalesce around an obvious opposition. Jeremy Corbyn is not that man. Remainers are already gutted that he failed to put in the hours for them over the EU Referendum, let alone centre-left Labour voters who are upset with him for failing to represent their views full stop. So it falls to the Lib Dems who have already been out to say “This is your chance to change the direction of your country”. But they could only hope to get up to 20-30 seats; not enough to put a dent into Theresa’s lead. The SNP could be a thorn in her side but having already wiped out Labour in Scotland what more can they do in the rest of the UK, given their renewed focus on independence? 2) Our electoral system means we vote differently. The referendum was proportional: each single vote edged the result closer to the 50% finish line. But now it’s a general election, First-Past-The-Post. Those millions of Remain voters will be distributed unevenly through constituencies. For those hoping to turn this election into a mandate for a referendum re-run, or to at least affect the path of the Brexit negotiations from here, the Remainers will want to point to x million voting for ‘Remain’ candidates. But will candidates declare in that fashion? Will people vote in that fashion? There will be plenty of disgruntled Conservative Party Remainers who would struggle heartily to put their cross alongside anyone other than the Tories. Recent by-election results have shown it can go both ways: Richmond was lost to the Lib Dems, partly due to the strength of the Remainer view (and with outgoing MP Zac Goldsmith as a prominent Outer); but the Conservatives won a historic victory in Labour stronghold Copeland as Corbyn’s anti-nuclear stance weighed on a constituency where that industry is a large employer. In other words, as much as this is the “Brexit Election”, it will become very murky to deduce anything from it with regard to what kind of Brexit we might have or whether there are regrets. That was a single issue. An election is about much more than that. So what will we find out? – Absent a massive shock, Theresa May will return stronger. She called it; she will win potentially the biggest Conservative majority in decades; she will have a mandate. This improves party discipline: in the absence of an effective opposition there is always the risk the Conservative Party will provide their own opposition by splintering within. Sorting this out reduces the risk of a “No deal” situation. Expect a flurry of polls in the next few weeks. Expect the Conservative lead to narrow, simply because even distraught Labour voters may find the prospect of a massive Tory victory too much to bear. They may have wanted to signal to Corbyn that he’s useless, but now there is more at stake. Having said that, the strength of Labour voter feeling against Corbyn is insanely high. [Anyone else would start a new party… but historical failures for left-wing parties on that front have snuffed out any initiative]. Therefore the Lib Dems will benefit, meaning a Lazarus-like rebirth from their current pitiful count of 9 MPs. But the polls will also focus on “Regretful Leavers”. Who would vote the same as they did in the referendum now? Ah, but the devil is in the detail: where are they based and can they bring themselves to vote outside of party lines? Or vote at all? Or maybe they regret voting Leave but their constituency MP has too large a majority to unseat? In other words, the polls are going to be even more useless than normal. GBP has risen as we face the prospect of a stronger government, and a reduced risk of a disorderly departure from the EU (although that risk is still woefully underpriced). From here, the greater uncertainty still comes from the French election this Sunday, and the German elections in September. Does a greater majority for TM strengthen her hand when facing Macron or Merkel? Possibly, although claiming any great voter coherence for a Brexit package when they are faced with the choice of a constituency MP is tough. But it probably gives TM the mandate to continue with what she has outlined thus far: leaving the single market and other EU institutions. If anyone were still in the Denial stage of Grief, this election will put an end to that. Hopefully we will reach Acceptance without too much Anger. An old colleague, when asked how he was doing, would always reply “like a Duck”. No, he hadn’t taken to squawking when around bread, but rather that he looked serene on top, but propelled by panicked flapping underneath. The market is currently similar. 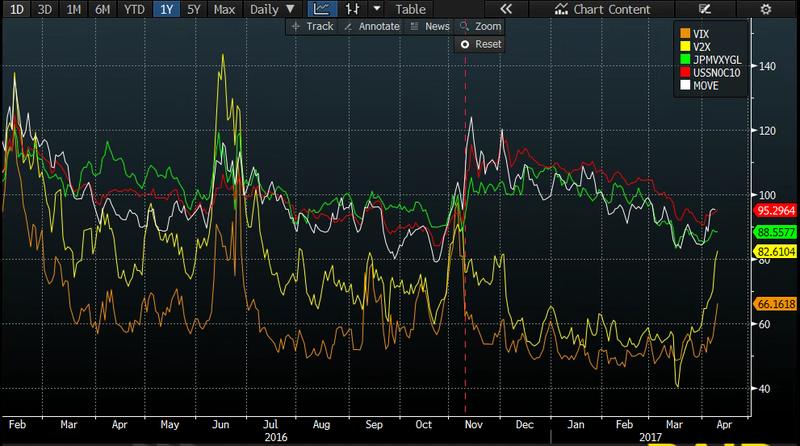 Although many prices of many assets are within the year’s ranges, and implied volatility measures have been falling, there is the sign of a flapping webbed foot or two emerging in the gloom. This was normalised as of the lowest levels of vol in the summer of 2014. 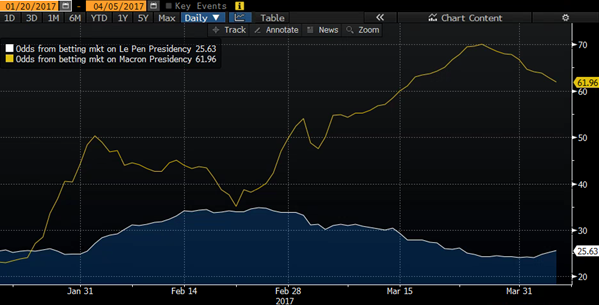 It’s been noticeable since the Trump election that FX and rates vol has stayed elevated as equity vol has fallen. But not in the last week or so. Those lines at the bottom are coming right back at ya. Various reasons have been given, not least that with the VIX around decade lows, it was cheap for a bit of France Presidential Election wobbling. Or for a Russia/US war. Or for a US/China war. Or indeed any other wars that may now be looming after the President changed his mind on Syria due to Ivanka’s (frankly understandable) upsetment. [Along with the market realising that “Republican Clean Sweep” doesn’t mean “President can do whatever he wants”, they need to wake up and realise that the White House staff is very much prone to change in terms of who is the influencer]. Those are genuine risks and should be on every investor’s radar. But these kinds of moves in the VIX may be symptomatic of something else: positioning. When all else falls quiet, that’s when we can shine a light on the tiny exit doors for markets where positioning becomes too big. There is still a large short position in US rates: the US 10yr yield is therefore still vulnerable to a wobble. 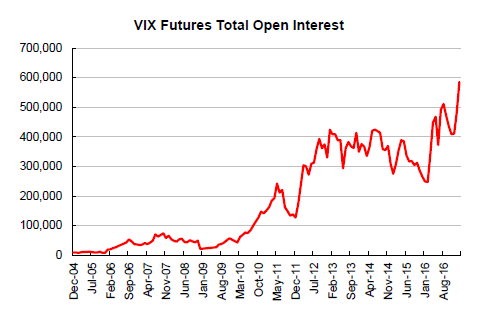 But let’s take a look instead at another important market that has grown in size – the VIX. We can convert the AUM of these ETFs into a USD vega equivalent after adjusting for leverage and short interest. 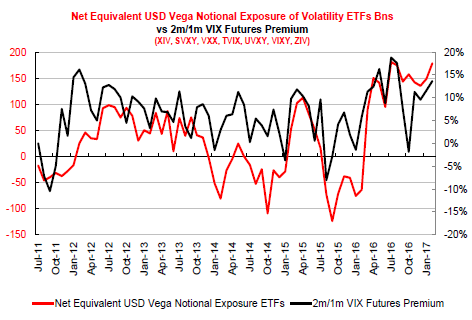 As we can see from the left chart below, the vega from these ETFs is often worth 30-40% of the entire open interest in the futures market, making them a very significant driver of volatility at present. The right chart shows the impact of the ETFs on the VIX futures term structure. ETFs have to constantly roll their VIX futures positions from the front month to the second month (the two most liquid contracts). 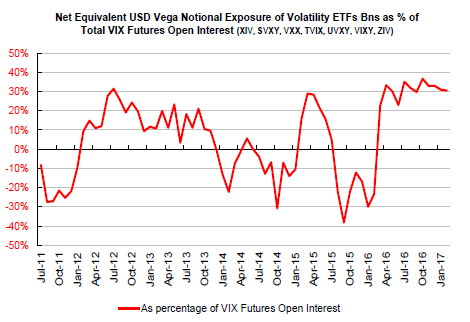 Therefore, when ETFs are very long volatility, they exert steepening pressure on the VIX futures curve, as they keep selling the front month contracts to buy the next month ones. 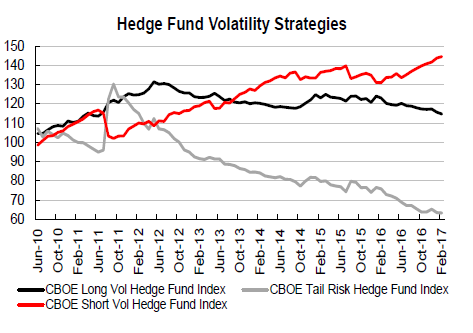 Similarly when the ETFs are net short volatility, they exert flattening pressure. Again, that makes sense, because central banks’ massive interventions worked deliberately to pump up our depressed deflationary animal spirits. They wanted a world of no volatility. After all, 2008 had quite enough to last us a lifetime. The trouble is, the period of no vol has also lasted a lifetime. The emergency turned into the norm. Selling vol became a strategy in itself. Usually, that’s fine. One day the world changes, the strategy stops working, and the world moves on. Creative destruction. But what if an entire strategy were devoted to an asset that itself was an input to a whole bunch of other strategies? What if the world used that asset as a kind of measure of the world’s Fear? What if that asset suddenly had no price? What would the world think then? Prices for the CBOE Volatility Index, the market’s favored barometer of volatility, did not update for the first half hour of the trading, a result of market volatility that also led to erratic quotes in S&P 500 options, Suzanne Cosgrove, a spokeswoman for the CBOE said. Traders who wanted to buy and sell SPX options were held back because a lack of liquidity caused problems in their pricing. Many were at zero or had bid/ask spreads so wide that they were unusable for trading. As a result, SPX options barely traded. “Basically, the computer market makers that sit behind it all were flashing ‘I don’t want to trade’ signs,” said Jim Strugger, a derivatives strategist at MKM Partners. The lack of liquidity was not restricted to SPX options, but was broad based, with even normally very liquid sector Exchange Traded Funds (ETFs) hardly trading in the first hour or so, strategists said. However, the market righted itself by 10:30 a.m., Spencer said. 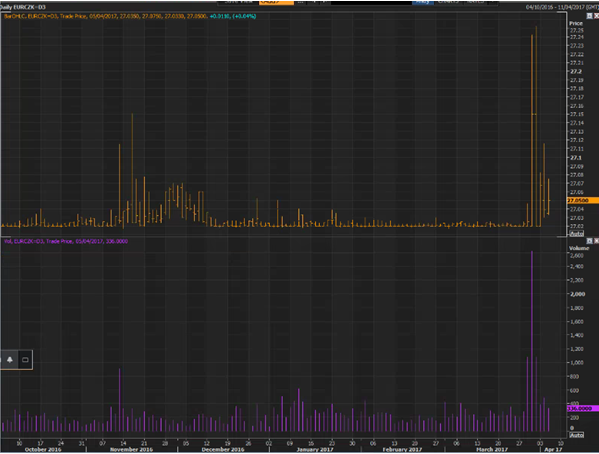 When the volatility index did start updating, it quickly shot up to up 25 points to 53.29, the highest since Jan 2009. While options volume was robust later in the day, with trading volume of about 31.5 million contracts, nearly 75 percent higher than what is normal, the lack of liquidity in the first hour is likely to raise eyebrows. “There is no doubt that people are going to look back instantaneously and start evaluating liquidity just as they did after May 2010,” said Jim Strugger, a derivatives strategist at MKM Partners. Oh Jim, if only we had. But we haven’t. And the difference now is that there is an awful lot more risk out there on the table. August 2015 didn’t have Trump or Brexit or Le Pen or a new Cold War or indeed, anything much except for some worries about China. Just remember the Duck and ask yourself: At what point does the frenzied paddling up-end all the calm serenity? Spring has well and truly sprung, though many currently feel more like they’re being continually pronged by a wayward mattress spring. It has certainly been a tricky few weeks, with stocks and fixed income rallying, and volatility plunging. On March 15th, when the Fed hiked rates for the second time in just 4 months, weren’t we supposed to be on the brink of a brave new era? A “proper” hiking cycle? Inflation back, baby, and you better believe it? Now instead we find ourselves well and truly stuck back to the future, with the dominant narrative being that Carry is King. Climb that wall of worry: buy stocks, buy bonds, sell vol, and keep on picking up the pennies in front of the steamroller. So let’s get this straight. Into the end of the quarter, specs were moved to massively trim their short 10y exposure, but increase their short in the front end? Sure, there is some rationale to this, if we believe the Fed are hiking in the near term, but we are not convinced the US economy is robust enough to deliver lots more hikes in the future. You’re sitting there re-reading that paragraph, mulling it over in your mind. You’re wondering if there is indeed enough momentum in the US economy. You’re wondering what Janet Yellen might do, the crazy old dovish hiker. This is where we need to stop. Yes that’s right, he’s working on it now, and trade is something he can affect by executive order alone. The market is still figuring out how he can deliver tax reform now that the Obamacare Repeal imploded, but it’s so stuck on that, it has failed to spot what else is on the horizon. In fact, its eyes have glazed over, and it’s hit the shift+f9 buttons that tell it to keep on carrying, because that’s what worked for the past 7 years, right? 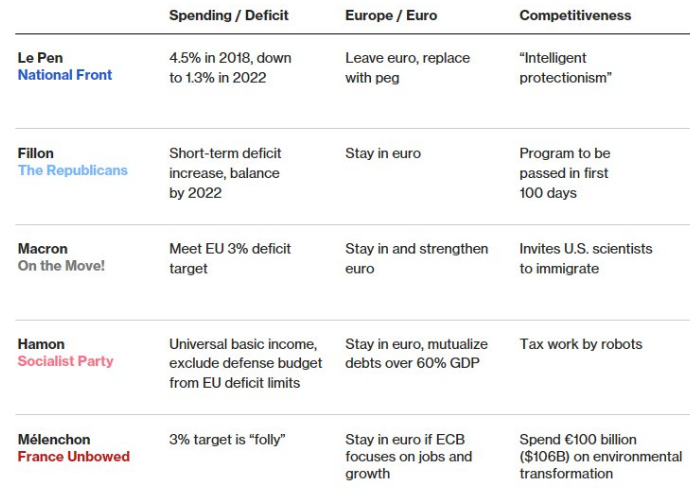 So the options market is now almost entirely ambivalent about the risk of France leaving the EU or the Euro, even though one of the two most likely second round candidates in its election in just 5 weeks’ time has both of those as a manifesto pledge? The Euro may have faced an existential crisis in 2011-12, but as we should now appreciate, it is by crisis that the politically-derived currency is forced closer together. Now, 6 years later, with an economy on its knees, a deeply unpopular President and a country unfortunately beset by several debilitating terrorist attacks, we think the French aren’t having their own existential crisis? Or at least that the risk of that is so small as to be unremarkable? Well, maybe these can be written off as idiosyncratic, country-specific risks. We have seen enough flash crashes over the past few years not to worry, right? But those happened without the backdrop of a reshaping of the global political order. They happened before central banks became an irrelevance. They happened when we could still try to plot the path for the global economy with some kind of certainty. Not when Britain chooses to leave the embrace of its largest trading bloc; or when a political novice becomes leader of the free world; or when France and Germany face existential elections for their heads of state. So, one swallow does not a summer make. The summer is more likely beset by a market coming to terms with how fiscal policy works; what the Separation of Powers actually is; how trade negotiations take place; rather than its usual quantitative play off between risks of inflation and the risks of volatility. Until then, carry on carrying the spring-time swallow.